A new Nebraska study suggests that high-load training better conditions the nervous system to transmit electrical signals from the brain to muscles, increasing the force those muscles can produce to a greater extent than does low-load training. A recent study from the University of Nebraska-Lincoln has given new meaning to the concept of brain power by suggesting that physical strength might stem as much from exercising the nervous system as the muscles it controls. Nathaniel Jenkins and his colleagues may have uncovered some answers by measuring how the brain and motor neurons – cells that send electrical signals to muscle – adapt to high- vs. low-load weight training. Their study suggests that high-load training better conditions the nervous system to transmit electrical signals from the brain to muscles, increasing the force those muscles can produce to a greater extent than does low-load training. Muscles contract when they receive electrical signals that originate in the brain’s neuron-rich motor cortex. Those signals descend from the cortex to the spinal tract, speeding through the spine while jumping to other motor neurons that then excite muscle fibers. Jenkins found evidence that the nervous system activates more of those motor neurons – or excites them more frequently – when subjected to high-load training. That increased excitation could account for the greater strength gains despite comparable growth in muscle mass. “If you’re trying to increase strength – whether you’re Joe Shmoe, a weekend warrior, a gym rat or an athlete – training with high loads is going to result in greater strength adaptations,” said Jenkins, an assistant professor of exercise physiology at Oklahoma State who conducted the research for his dissertation at Nebraska. The dissertation randomly assigned 26 men to train for six weeks on a leg-extension machine loaded with either 80 or 30 percent of the maximum weight they could lift. Three times per week, the participants lifted until they could not complete another repetition. Jenkins was able to replicate the findings of several previous studies, seeing similar growth in muscle between the two groups but a larger strength increase – roughly 10 pounds’ worth – in the high-load group. But the researchers also supplied an electric current to the nerve that stimulates the quadriceps muscles used in leg extensions. Even at full effort, most people do not generate 100 percent of the force their muscles can physiologically produce, Jenkins said. By comparing the force of a participant’s “hardest” unassisted kick with the maximum force they can generate when aided by electric current, scientists can determine how much of that capacity a person has reached – a measure known as voluntary activation. When adjusting for baseline scores, the researchers found that the voluntary activation of the low-load group increased from 90.07 to 90.22 percent – 0.15 percent – over a three-week span. The high-load group saw their voluntary activation jump from 90.94 to 93.29 percent, a rise of 2.35 percent. Jenkins also tested his hypothesis another way, asking participants from both groups to kick out at 10-percent intervals of their baseline strength – from 10 percent all the way up to 100 percent – after three and six weeks. 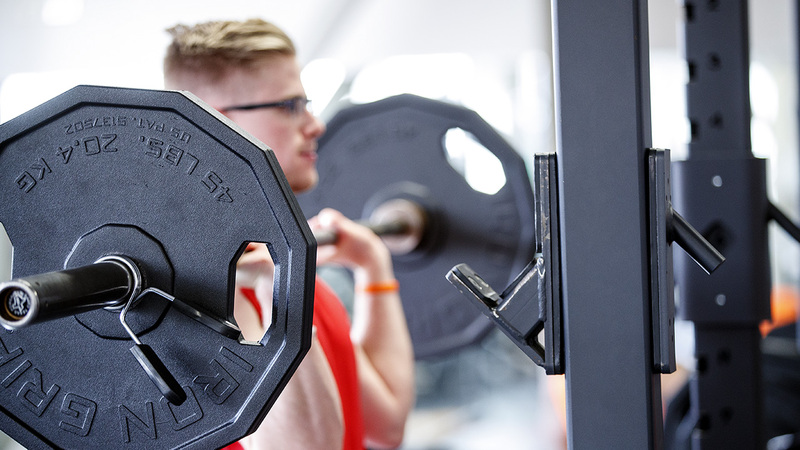 If high-load training does improve muscle efficiency better than low-load training, he reasoned, then high-load lifters should also use a smaller proportion of their strength – that is, exhibit lower voluntary activation – when lifting the same relative weight. That’s what the data generally showed. Voluntary activation in the low-load group did decrease slightly, from an average of about 56 percent at baseline to 54.71 percent after six weeks. But it decreased more in the high-load group, dropping from about 57 to 49.43 percent. Jenkins maintained that low-load training remains a viable option for those looking to simply build mass or avoid putting extreme stress on joints, a priority for older adults and people rehabbing from injury. Still, he said, the new study lends even greater credence to the notion that when it comes to building strength – especially amid a busy schedule – heavier is better. Having now embarked on a career in exercise science research, Jenkins also conveyed his gratitude toward former doctoral adviser Joel Cramer and the opportunities granted him at Nebraska. Jenkins detailed his findings in the journal Frontiers in Physiology. He authored the paper with Cramer, associate professor of nutrition and health sciences; Terry Housh, professor of nutrition and health sciences; Nebraska doctoral students Amelia Miramonti, Ethan Hill, Cory Smith; and doctoral graduate Kristen Cochrane-Snyman, now at California State Polytechnic University.